The Punishment Due: Crazy Bobby’s Craaazzy Bonanza Box of Craziness!!!! Every year, Mantic games does a so-called “crazy box” which basically is a mystery box of “random” miniatures -older miniatures that are not selling very well and that clutter up their warehouse- at presumably a steep discount if one were to calculate the retail prices of the contents. This year, Mantic offer up their normal GBP 25 Fantasy and Sci-Fi boxes, but also the GBP 99.99 “Crazy Bobby’s Craaazzy Bonanza Box of Craziness!!! !” (actual official name on the invoice), which was touted as a massive stack of minis and each box was to include one “super value item” such as current rule books, base game sets or even newer resin premium large minis such as the treeman or the dwarf behemoth. Also a few boxes would include a gift certificate for GBP100 making the box effectively free. One box would include a golden ticket where Mantic will make an actual miniature in the likeness of the lucky buyer! I might have bought one or two of the smaller crazy boxes in years gone by…I am a sucker for those sweet, sweet Loot Boxes and their allure of secrets and mystery! So naturally, in a moment of weakness this last Black Friday, I lost all self control and ordered one of these big bonanza boxes together with a discounted Walking Dead KS set and some other black friday goodies. I mean…the Loka game set for 10 pounds? Yes please! 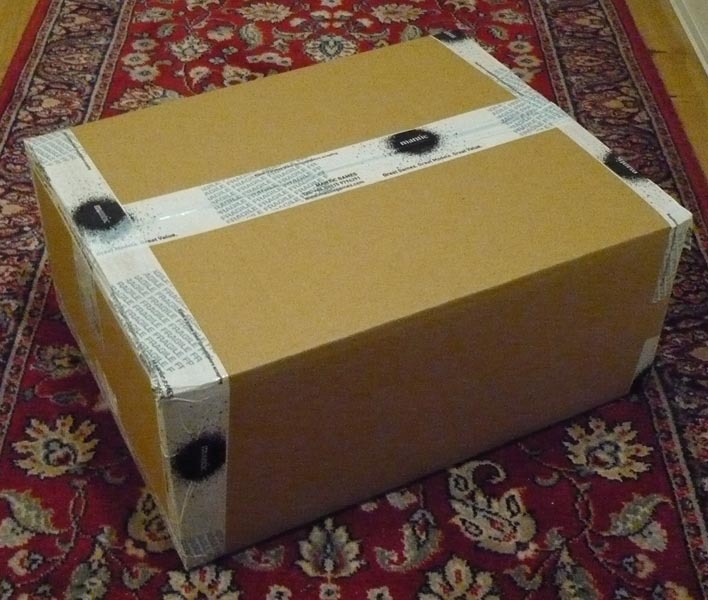 Even though I know full well that such crazy boxes always, always, always for the main part contain the dead stock crap they cannot manage to sell at full price, and work as a vehicle for them to get rid of said dead stock while at the same time getting in some much needed cash. And opening them inevitably is a bit dissappointing as all the stuff is old (well, duh!). But then there is the anticipation and the rush of the opening itself, so maybe it is all about feeding an addiction? Oh dear…. 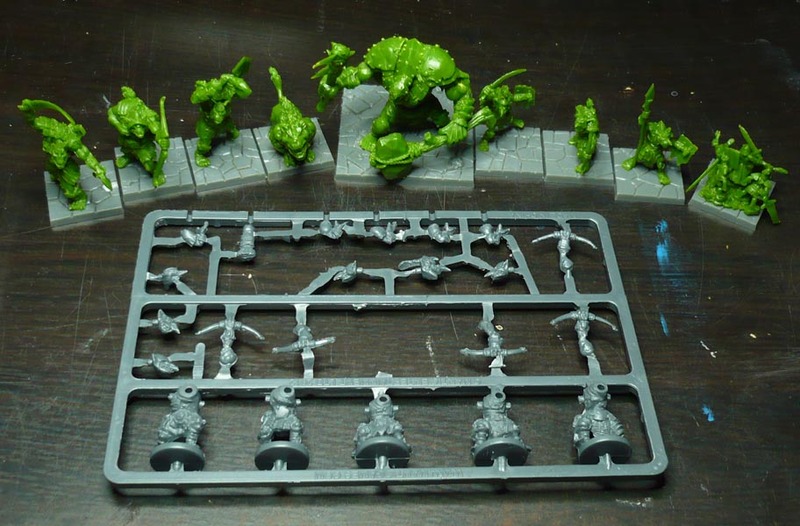 After the initial rush of rolling the dice by placing the order subsided, the regrets started coming: Thinking about it I imagined I could expect to get some of the old terrible basilean footmen and other older KoW sprues, some of the modular terrain sprues and a crapton of older KoW, Dreadball and Deadzone restic -just like last year, only more of it! …and at least one rulebook or Dungeon Saga expansion I already had. Why oh why did I order this? Good thing it arrived today then. The mystery box. What does it contain? Open sesame! Half the box was packing material I chucked out before taking the picture. The spread. On the bed. The damage doesn’t look as bad from out here. No certificates. Not that I really expected to get one, but hope springs eternal. I wonder how many of these boxes actually are made and sold? 10? 100? 1000? I imagine the true number is closer to a hundred than to a thousand, but there is actually a real possibility that maybe it is even closer to 10 than 100. Mantic is after all, a much smaller company IRL than they give the impression of being online. This is all just guesswork anyway. It is completely possible that all these crazy boxes are somewhat bespoke and built out of some preset options as the orders come in during the sales period. No terrain! This was a bit of a surprise. I was looking forward to building a randomly modular house or ruin or something out of just what I got. But I didn’t get any this time around so there we are. 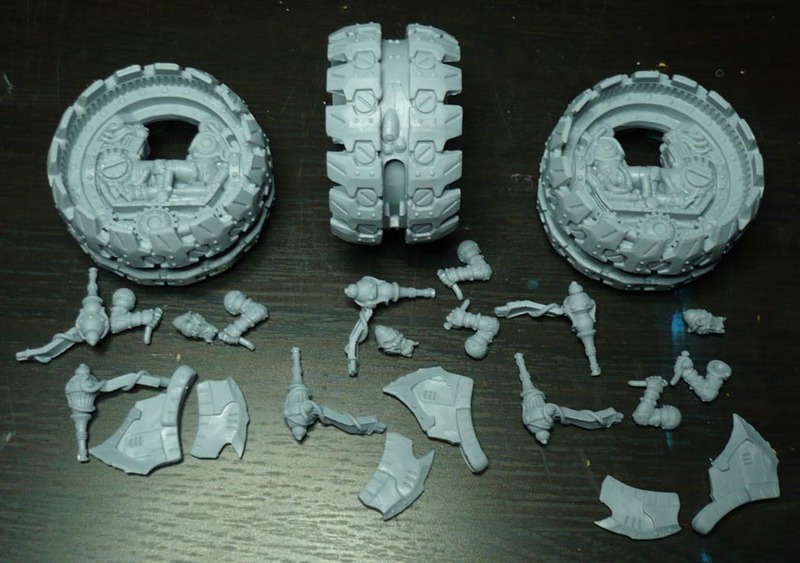 Which I actually did not have already, as I dropped out of the second warpath kickstarter due to reasons. I count this as a win! Also, I guess this was the “super value” item in this box. Good thing it was not one of the many Mantic books I already have! Dungeon Saga: The Black Fortress booklet that I did have from the DS KS and therefore is a miss. Odd bits: A pack of the original style Dreadball clear hex bases, 24 in all. Which is OK to have some extra of, I guess, especially since the two DreadBall KS I participated in delivered more minis than I have bases for. The Mars Attacks! Martian Dreadball crossover team, together with the original referee bot. 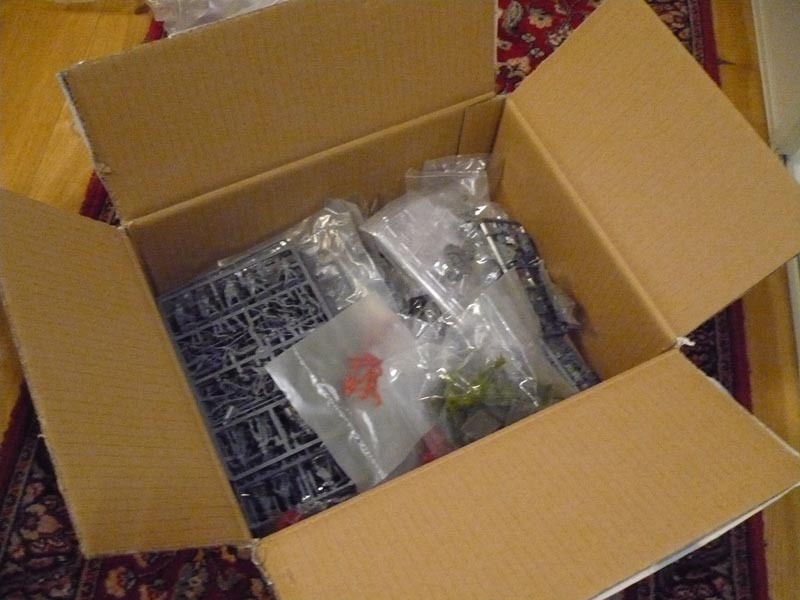 The refbot being the only mini in this box that came loose, as in not in a baggy or on a sprue. Yes, the clear helmets were included, just not in the picture as I have squirreled them away for safe keeping. Too bad I already have painted just such a team. I probably won’t be painting them for DreadBall use this time around. No other DreadBall minis. Which also was something of a surprise. I would actually have bet on getting some third tier obscure MVP or three. Mars Attacks in PVC, refbot in restic. This was interesting. Most of these minis are KS exclusive and/or Mantic Point scheme special minis . Might they not be moving much or at all then? Not surprising, considering it is a niche-within-a-niche game and that there has been no support to speak of for the game since it’s release several years ago. I wonder how much longer the Mars Attacks! licence lasts? (and how many players actually exist for this game? Is anyone still buying expansions or minis for this at all?) At any rate, it is a fun and lighthearted game and I like it alot. It would be a shame to see it go. The mechanic-in-cockpit part, but with no vehicle this is not a complete mini. I would have appreciated a UFO or even a big stompy robot for him to drive. Oh well. All these are made in PVC board game plastic. 8 minis plus 3 casualties and the mechanic-part. I do have them all from the KS, but they are fun enough so that is not a problem. 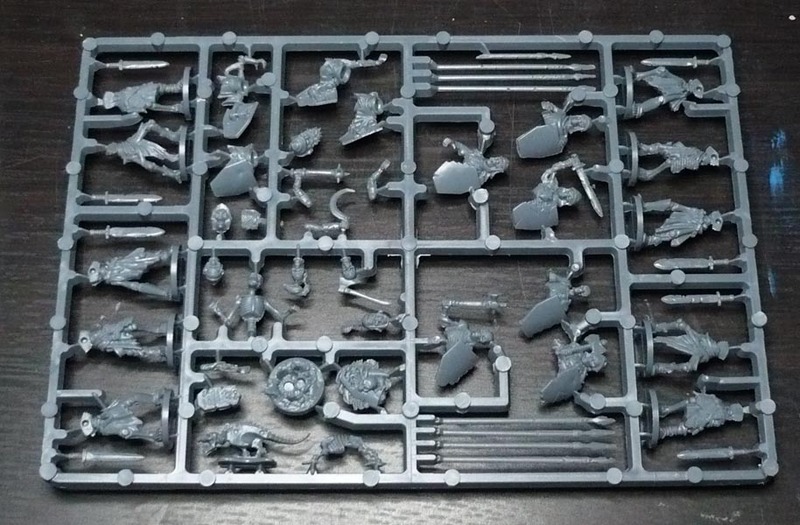 30 Elves, consisting of a sprue of 10 each of Bowmen Command, Bowmen Troop, and Spearmen Troop. Plus 3 casualties and a big cat. Good quality details. As long as you accept the reediness of the stick-thin elves. I would have preferred them to be larger, but all in all don’t mind this aesthetic, so this is OK. 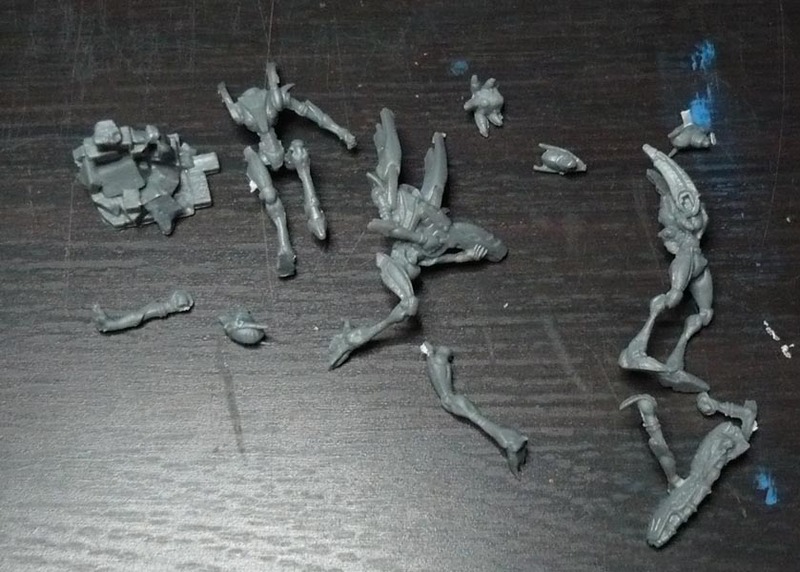 I think I have a couple of unbuilt elven sprues from before (not sure which), so this could possibly be the start of an army or a sizable allied contigent. 5 Dwarf Ironclad. Good quality details. 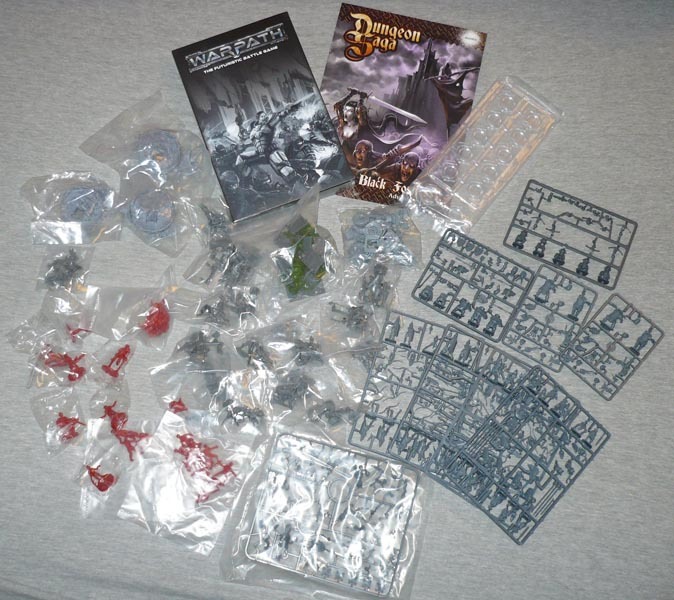 I have an unbuilt dwarven army set I bought with the original KoW KS. I can use this to start that army off and decide on a colour scheme. 10 Undead Skeleton Troop, plus 1 half skeleton and a skeletal dog (or is it a rat?) Good quality details. Love these skellies and look forward to adding them to my existing KoW undead army. 5 Lower Abyssals and two small imps. These are actually rather recent models from the second KoW KS. Are they perhaps not selling as well as projected or are they mainly included to increase the percieved value (over older sprues)? Good quality details. Yup, have some from the second KoW KS. never got around to building or painting them though. This will be a starter. So…red or blue devils? Brown you say? Like the imps in the original Doom? Yes, that might very well be just the ticket. 5 KoW Goblin Spitters. 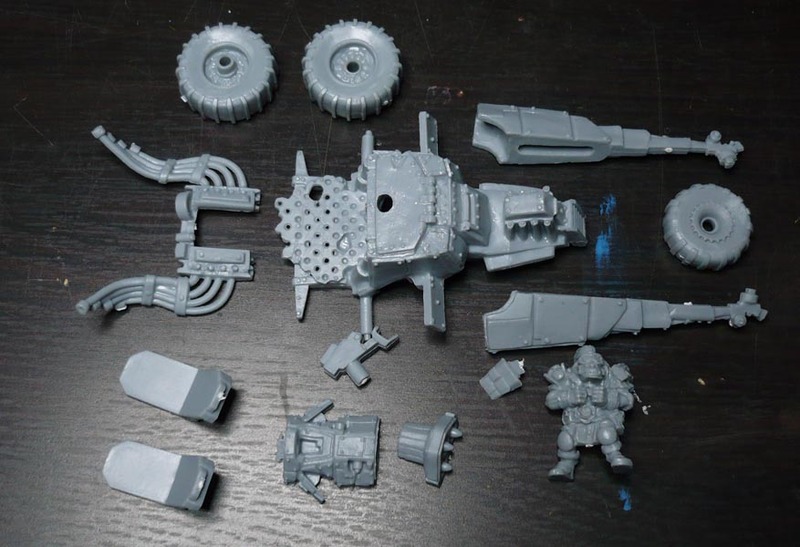 It looks like something in the middle there is missing, but some Google-Fu shows it is just some more sprue that has come off. These minis are infamously soft in the details. Not good. 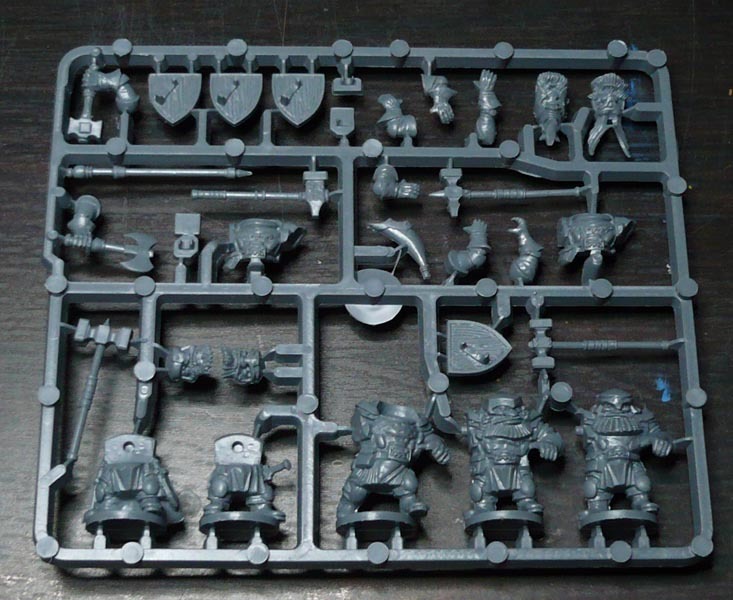 Luckily this is the only sprue of this generation of bad quality hard plastics (consists of Basilean men at arms and all Goblins -to be avoided unless REALLY cheap!) included. And incidentially the only KoW-minis in the box I do not already own some of. 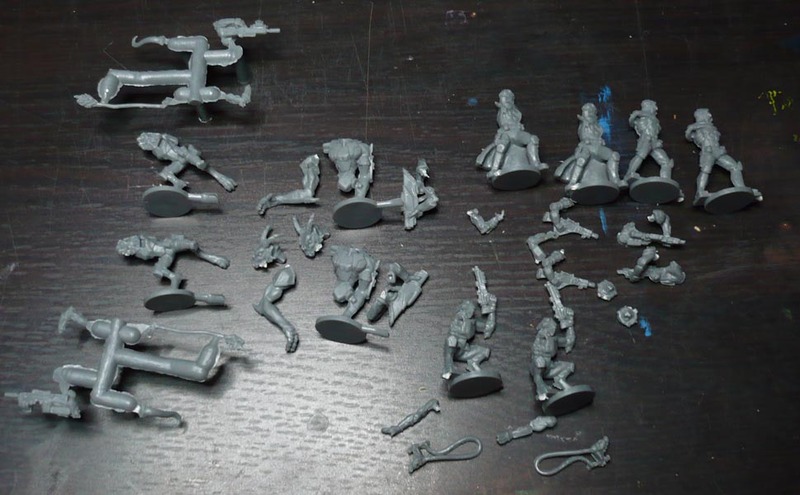 And the Dungeon Saga Orcs and Goblin assortment. 1 each of 9 different sculpts. These are the only Dungeon Saga minis in the box. I had excpected Abyssals, as they were prevalent in the crazy boxes last year. But these are good as well. Love the snotlings orclings although they are difficult to get at to paint, being preassembled and all. 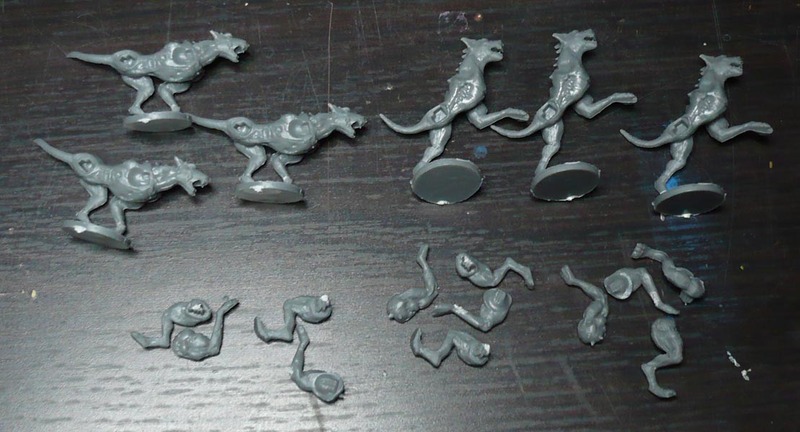 All fantasy minis count: 64 plus three casualties, a big cat, a skeletal dog, two small imps and half a skeleton. 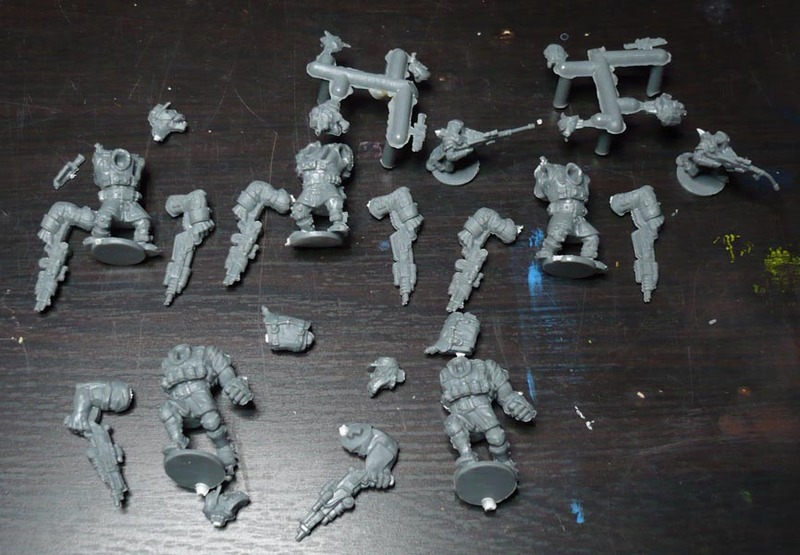 2 old sprues of Warpath Marauder Command, 2 minis in each. 1 old restic Raptor trike vehicle. One of the earliest restic minis they produced. There were two pairs of identical baggies, one with the runner alone, and the other with the two-gunned commando and the goblin sniper in it. And then there was one seperate baggy with the just the two-gunned commando without the sniper in it. Which was strange. I must say it is a bit of a bummer when there are several identical poses. Also I have all of these from before (which is true of all the first edition Deadzone minis). Total count: 9 marauders, 2 goblins and a vehicle. Three identical packs each of two dogs and two 3rd gen troopers; and a pack of 3 3rd gen heavy weapon troopers and a plague swarm. Total count: 9 3rd gens, 6 plague hounds and 1 plague swarm. 4 human troopers, 2 Sorak, 4 Yndij for a grand total of 10 minis. A single pack of 3 first edition restic Asterian Cyphers. Three -3- of the spanking new Veermyn Tunnel Runners! Woot! These I do not have from before, but I do have the makings of a Veermyn army from the second Deadzone KS, so this is a definate win! Made in PVC, not restic. Another win! I don’t actually think restic is as bad as it’s reputation, but I am not looking forward to the prepwork getting all those mouldlines off all those fiddly bits. On the other hand, I do this hobby to relax and take my mind off things, and the manual work of prepping is about as soothing as the painting, so I do not really mind. It is just something to keep the hands busy, I guess. As there are no bases for the minis, I will be printing my own. GBP 99.99 for the new Warpath rulebooks and 126 more or less random miniatures across several lines (138 including casualties, half-skeleton, imp, cat and dog. 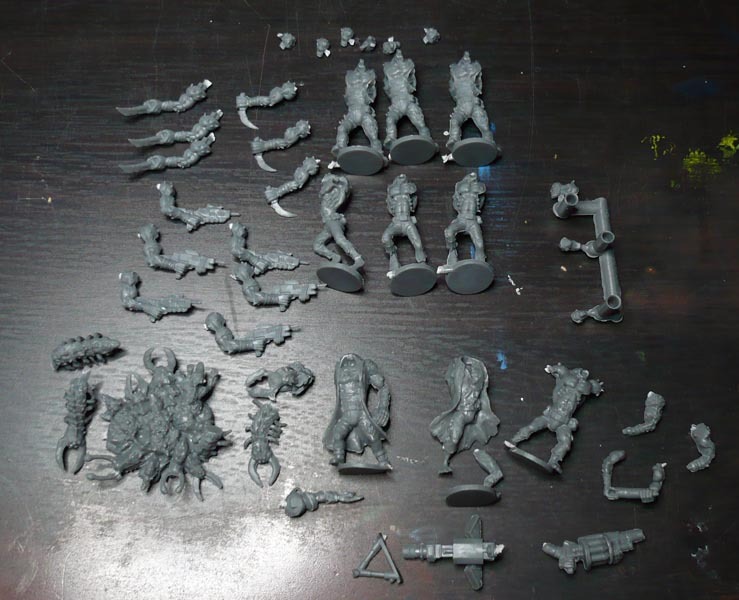 plus some parts for the bits box and 24 Dreadball bases.) Of this there are 4 smaller warpath vehicles and a Burning Cattle. Not too shabby value for money there at all, really. Unless I start thinking about that I already own most of the minis and what else I could have gotten for the 100 pounds. 1 Mortarion? Two start collecting boxes? One base pledge for some overstuffed KS game such as Massive Darkness, Conan or Mythic Battles Pantheon? (Feels like an unfair comparison, but is it really? After all we are talking X money for Y miniatures? and those games’ minis are arguably of higher quality.) Taken my family out to dinner at a restaurant? yeah…Lets not go there. I could have spent it all on actual gambling. Or drugs. I believe this is a better addiction to have than that. Much cheaper as well. Did I need these minis? Not really. But many, if not most of them, will find use once I get them done. Do I regret buying it? To be honest…yes, a bit. Mainly because I had most of the minis already. And they are older mantic minis… which means not the best quality there is to be had. Some of those early restics have soft details and horrible mould lines that need a lot of work to remove. All of which I knew when I ordered it. (Damn those alluring loot boxes! Shiny syndrome, ho!) On the other hand, this could have been much “worse”, with, say, a Dungeon Saga expansion I already have and old restic from factions I do not care that much about (such as basileans or the enforcers). So I am really not dissappointed in what I got. I did buy the box in the spur of the moment, even though I really knew better than to do it. If I just pack these away into the Mountains of Minis I will have just wasted my money completely. So now the punishment is due. Time to own up and get to work.